Fleets belonging to several alliances were locked in combat on the border between Providence and Derelik regions (G-5EN2). This was the second biggest fight Providence has ever seen. Over 1,000 pilots fought, from five factions, all fighting on three sides of a single battle. In the end NC dropped its supercapital fleet to control the area. Provi also altered arrangements with RvB to provide an additional battleship fleet. Originally RvB and Provi were going to fight each other at around the time NC dropped the SBU’s in G-5EN2. NC prepared Lokis and flew from their home station in Hasateem (Derelik) to the nearby system G-5EN2 (Providence) to engage Provi. As usual, whena large fight is expected, dreadnought pilots are put on alert in case they need to be used to escalate the fight. 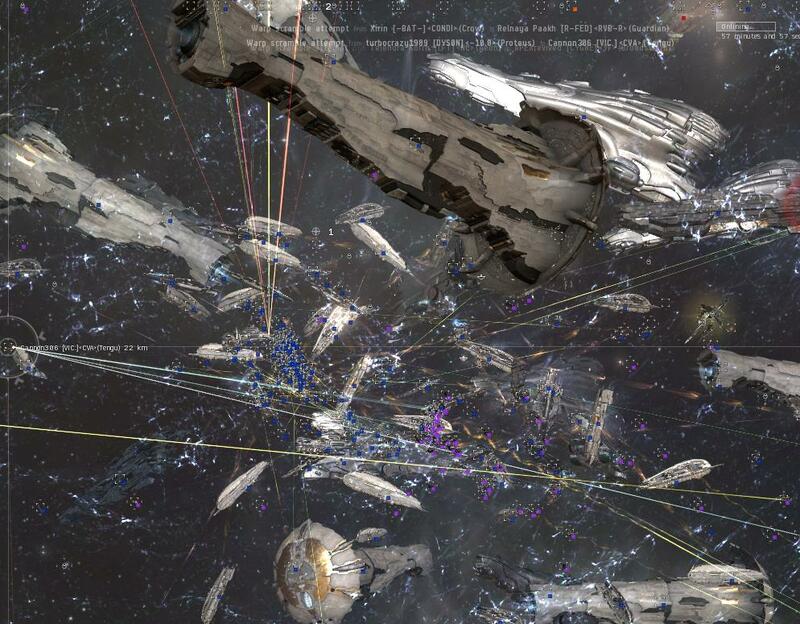 NC assumed Provi fighters would ball up tight around their FC’s so the NC decided to try short range guns for a change and just fly into the middle of a Provi swarm. NC entered the system with their Lokis and warped to the out-gate, leading to 9-F0B2. Scouts reported that Provi was on their way, ans so was RvB, and also Goonswarm had a 75 man harpy fleet 2 systems out, waiting. Their intentions unknown. Travis was expecting bomber runs so he ordered his pilots to prepare by creating an overview tab with only bombers on it. As the Provi bombers jumped in and warped out to get into position, they were immediately targeted and shot by NC. Provi’s wisely orbited the gate at 20km, keeping them spread out. Nightmare class battleships, renowned for their damage output, decloaked and targeted the NC logistics wing. Two Guardian class cruisers were immediately volleyed. This was a bad omen for NC, who had few logi pilots in fleet. Once the logistics wing sinks below a certain threshold, they cannot keep themselves alive and repair dps fleet at the same time. Most logistic pilots die before they even realize they are in trouble because they are hyper-focused on others. The Provi bombers that didn’t get picked off, warped away. NC then went to work on the Nightmares, but their logistical support was too strong. The Nightmare tanks easily held and they returned fire, effectively ripping through the Loki hulls. Travis, now aware that he needed to bring down Provi’s ability to repair, switched to targeting logistics but they were out of range. Minmatar ships have short optimal ranges to begin with and their short range guns compound the problem. The Lokis made up for it by chasing the logistics down by overheating afterburners and webs. Still, the Lokis were getting picked off by the Nightmares. Travis assessed the situation and had to quickly decide to retreat or escalate. A critical skill for an FC is to know when to retreat, to mitigate losses, and when to escalate by bringing in reinforcements. Escalating a fight can quickly spin out of control and lead to B-r5RB or Asakai sized battles. Travis escalated. NC called in their superbly trained triage carriers to join the fight. An Archon appeared, followed by three others. Jin’taan immediately switched to the archon and focused fire and started to neutralize its capacitor. 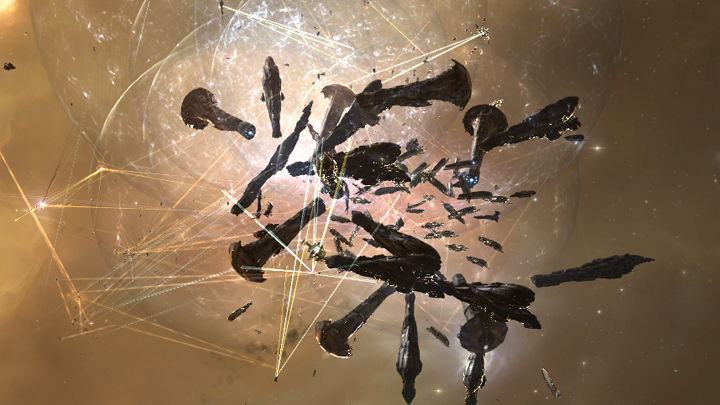 Goonswarm also jumped in and targeted NC, but the Lokis returned fire and blasted through them, forcing the assault frigates to move out of range or bail out. Provi battleships were still holding up well and could have ridden out the damage a while longer. Along with their bombers and AHACS they could have continued to kill Lokis effectively. They also had an RvB dominix battlehsip fleet arriving to help them. Jin’taan called in triage support. This is a normal tactic, but against an enemy with capitals nearby, it is a risk. The expected counter attack would have been a few dreads, but this was NC and Vince Draken was monitoring the situation closely. The arrival of Provi’s Chimera class triage carriers gave the waiting Vince Draken something to shoot and he called down the NC hammer. He sent in the dreadnaughts, followed closely by super carriers and titans. Massive ships started appearing all around. The super carriers immediately used smart bombs to ward off bombers and damage the Nightmares and small ships in the area. Giant ECM bursts from the super carriers broke target locks in the area. Titan’s doomsdayed the Provi triage carriers right off the field. Then they turned the massive guns on the Nightmares. Gorgon Empire arrived in a fleet of Macharial class battleships. Macharials are known for speed and long range. They were here to 3rd party the fight and kill off injured on both sides. The supercapitals and Lokis were not good targets for them so they shot at Provi and RvB battleships. It was Provi’s turn to make a decision, but Vince had brought overwhelming force to discouraged a counter drop of capital ships. The amount of firepower Vince brought was way beyond what was needed. Even after the first wave entered the fight, he ordered in successive waves of supers and titans. This kind of military activity is only seen for important battles for stations, or to free trapped supercapitals. This move was highly unexpected at this scale. NC was effectively webbing and killing off logistics while the Titans and Dreads were punishing their Nightmares. Remarkably, Provi decided to fight on because retreating would have left pilots behind, and the Nightmares were having some success speed tanking the titans and dreads. They wanted to kill as much as they could, until their last Nightmare fell. Pandemic Legion, with their ally Hax corp, jumped in to 3rd party. They were not called, but they never miss a fight if word gets out. Pandemic’s Proteus fleet quickly spread out and webbed the Nightmares, slowing them down and allowing giant dread guns to apply more damage. The Gorgon Empire’s Machariels scrambled away and warped out not wanting to become the prey. Provi fighting hard, but going down fast. Travis noticed the Gorgon Empire fleet leaving and predicted where they would land. He warped the much faster Lokis to cut off their exit. G-5EN2 is a huge system, 64.4 AU wide. This gave him plenty of time to land first. The prediction was good and the Lokis landed alongside the retreating Macheriels. This time the close range guns worked and the Macheriels were quickly torn to pieces. The Lokis then regrouped with the supercapitals. NC and Pandemic were neutral but informally friendly, but Hax, a former NC corp, was set to red, an enemy. To avoid conflict at this battle site, NC pilots were ordered not to shoot Hax, but a saber pilot just saw red and bubbled Hax. This hostile act was caused Hax to turn around and killed him. Repairs could not save the saber pilot in time and the NC tackler was destroyed. No further incidents were allowed. This fight was over. Both sides were less than happy. NC was steaming that Provi pulled so many outsiders together to outnumber NC, but Provi could not believe that NC dropped so many supercapitals. Few GF’s (good fight) were seen in local chat. The happiest pilots were hordes of locals who turned out to loot the wrecks, like wrapped and spiked sand people. FC Travis is embarrassed at the gun changes that put NC in enough peril to trigger a massive super capital drop. FC Jin’taan beats himself up over minor tactical decisions, but mostly for calling in triage. In the end, nothing can hide that Provi had the upper hand in a battle against NC, until NC smashed the board off the table. But another interpretation might be that Vince Draken was sending a message, not to Provi, but to everyone watching that thinks picking off a titan or super from NC is a good idea. Take note fishermen. In all likelihood, the massive drop was caused by a combination of factors: To defend the Lokis with smartbombs, kill the shinny Nightmares, awaken NC supercapital usage, and to intimidating others from contesting NC, today and in the future. All this accomplished in one massive strike. Like a lion showing all its teeth to rivals while it hoards prey. Prey that was just barely big enough. A sign that NC is free and wild. I have been examinating out a few of your stories and i can state pretty good stuff. I will make sure to bookmark your website. You made some nice points there. I did a search on the subject matter and found most individuals will approve with your site. It¡¦s really a great and helpful piece of information. I¡¦m happy that you just shared this useful information with us. Please keep us informed like this. Thanks for sharing. Of course, what a fantastic blog and revealing posts, I surely will bookmark your website.All the Best! I’ve been absent for a while, but now I remember why I used to love this website. Thanks , I will try and check back more frequently. How frequently you update your website? It¡¦s in point of fact a nice and helpful piece of information. I am glad that you just shared this helpful info with us. Please keep us informed like this. Thank you for sharing. Hello there, just became aware of your blog through Google, and found that it is truly informative. I’m going to watch out for brussels. I will be grateful if you continue this in future. A lot of people will be benefited from your writing. Cheers! Very nice post. I just stumbled upon your weblog and wished to say that I’ve really enjoyed surfing around your blog posts. After all I will be subscribing to your feed and I hope you write again soon! Attractive section of content. I just stumbled upon your website and in accession capital to assert that I acquire in fact enjoyed account your blog posts. Any way I will be subscribing to your feeds and even I achievement you access consistently fast. I’m looking for blog sites that have really excellent advice on what’s in style and what the best makeup is. There are countless blog sites that requires comments on them. What is the intent of blog site comments? Is it real that blog sites are just discussion forum discussions with rss that would make it possible for the user to enjoy what they intended to view even more convieniently? Is that all the distinctions?. I as well as my friends were taking note of the nice items located on your web blog and so then came up with a terrible suspicion I had not expressed respect to the site owner for those tips. Most of the young men were for that reason joyful to see all of them and have now undoubtedly been taking advantage of those things. Appreciate your actually being considerably accommodating as well as for deciding on this kind of quality resources most people are really desperate to discover. My very own sincere apologies for not expressing appreciation to earlier.